Colombo, August 23, 2015. Kumar Sangakkara walks in to bat for the last time in Test cricket. Sri Lanka are chasing 413 to beat India. More realistically, they need to bat out three and a half sessions to save the match. They are 8 for 1. R Ashwin is bowling, and Sangakkara steps out and works his first ball into the leg side for two. Next ball, a confident stride forward for a drive to mid-off. Sangakkara doesn't face Ashwin for the next five overs. Camped at the other end against Ishant Sharma, he unfurls a couple of trademark shots that rouse the P Sara Oval, a whip off his toes and a straight punch past the bowler. Then, off the fourth ball of the ninth over, Dimuth Karunaratne gets off strike, giving Ashwin a shot at Sangakkara. Sangakkara is batting for the fourth time in the series. He has been out to Ashwin three out of three times so far: caught at silly point, caught at slip, caught at slip. Before the tour, Ashwin's research had thrown up an interesting fact about Sangakkara. "He's been lbw very few times to an offspinner," Ashwin tells the Cricket Monthly, and a quick glance through his dismissals reveals it has happened only three times: to Chris Gayle in 2003, Saeed Ajmal in 2009, and Moeen Ali in 2014. "It suggested to me the fact that he's actually looking to play for the balls that are hitting his pads, and that is what is happening almost all through international cricket. The spinners are getting wickets hitting the pads on the front foot, because umpires are willing to give it out. The trend is completely changed." It certainly has. Of the 14 offspinners with at least 150 Test wickets, no one has got left-hand batsmen out lbw as often as Graeme Swann and Ajmal, whose peaks coincided with the widespread use of the DRS, and the consequent willingness of umpires to uphold lbw appeals. Lbw was central to the way they bowled to left-handers - usually from around the wicket, trying as hard to beat the inside edge as they did the outside edge. Out of Swann's 122 wickets against left-hand batsmen, 43, or 35.25%, were lbw. The figure for Ajmal is 33.93%. Before the series against Sri Lanka, Ashwin's lbw rate against left-handers was nearly as high as those of Swann and Ajmal: 32.35% (it has since dipped to 29.20%). But Sangakkara's success against that line of attack, exemplified by his spectacular record against Ajmal - 1224 balls faced, 531 runs scored, four dismissals, and an average of 132.75 - told Ashwin he needed to try something different. "When you have to play in front of your pad and start protecting your pad, you start opening up," Ashwin says. "Your shoulder starts coming out a little in front. I decided that I should start spinning the ball and start beating them [left-hand batsmen] on this side [gestures to show an imaginary ball going past an imaginary outside edge]. "So what I was doing was, trying to really put body into the ball, go really hard at Sangakkara, and start drifting the ball into him. When I drift the ball, I start opening him up." With Sangakkara back on strike, Ashwin moves an extra catcher, M Vijay, to gully. From around the wicket, Ashwin gets the ball to drift in towards middle stump, and Sangakkara, following its trajectory, opens up as he comes forward, just the way the bowler wants. At the top of his backlift, his front shoulder points wide of mid-on and his bat points to the newly stationed gully fielder. By the time it comes down, the bat is at an angle, face closed towards the leg side. Apart from drifting in, the ball has also dipped late in its flight, and Sangakkara is nowhere near its pitch. He is exactly where Ashwin wants him to be. "I was just going through a good spell. He had a plan. That innings he wanted to use his feet, play me through the on side, play me against the spin, hit me straight over the top, so I was seeing what was coming. "So immediately I brought my air speed down. I started bowling slower. Because his intention was to come at me, he was not going to sit on the back foot looking for me to bowl a bad ball, so immediately he's committed to the front foot. I started slowing it down, just to [make him] reach for the ball. So when he reached for it, it just spun a wee bit. Nothing in the wicket also, just spun a wee bit." It's an elaborate description of a contest that only lasted three balls, but that's just how Ashwin speaks. Sangakkara reaches for the ball, trying to adjust as it spins away from him, and Vijay catches the edge near his right hip. Pats and handshakes from the Indian team, an ovation from the crowd, two rows of ball boys raising their bats to give Sangakkara a guard of honour. A great career is over. Drift it one way, open up the batsman, turn it the other way, take the edge. It takes skill, control and a whole lot of revolutions on the ball to do this, innings after innings. Ashwin's mastery over Sangakkara, and his bowling right through the series - 21 wickets an average of 18.09 - showed a bowler at his peak. Less than a year earlier, however, his career was stuck in an extended rut. At Adelaide Oval in December 2014, he had been left out of India's XI for the seventh time in nine Test matches. It was perhaps the lowest point in his career. It was also, according to B Arun, India's bowling coach at the time, "probably the best thing that happened to him". Not so much the fact of being dropped as the time and impetus it gave him to re-examine his goals as an international cricketer. "I guess he was really disappointed because he could not play," Arun says. "But then I guess you've got to move on, and we sat down and spoke a lot about what he has achieved and what he would like to achieve as a bowler. "He told me that he wants to be the best in the world." The history of cricket is also a history of career-changing moments, their effects rippling down the ages. A nameless Surrey professional nailing Ranjitsinhji's back boot to the crease. Don Bradman advising Greg Chappell to change his grip. Sunil Gavaskar advising Martin Crowe to rest his head against a wall. Brian Lara reading a book by Michael Jordan. Steve Waugh shelving the hook. James Anderson tearing up every scrap of advice he had been given and going back to his original, idiosyncratic method. To these you can add Ashwin's net sessions with Arun in Adelaide. "His confidence was a little dented," Arun says. "I wouldn't say low, but definitely dented, and those hours we spent in the nets - we spent long hours bowling. He would bowl before the Test match, he would bowl during lunchtime, bowl during teatime. He bowled a hell of a lot, and with a lot of purpose, you know? In trying to say, 'I want to be the best in the world.' It was not just, 'I'm bowling because I'm hurt, I'm not playing.'" A seam-bowling allrounder who was an important member of Tamil Nadu's Ranji-winning side in 1987-88, Arun played two Tests and four ODIs. 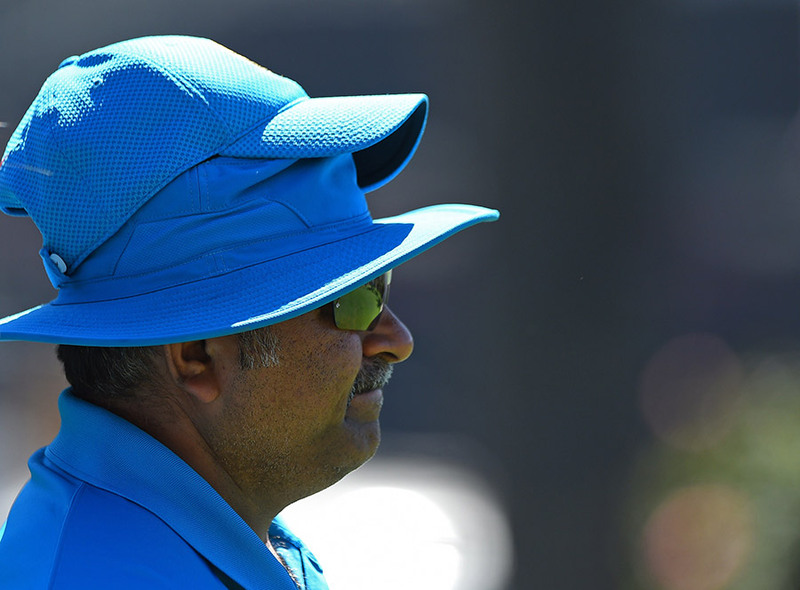 He took over as India's bowling coach towards the end of the England tour in 2014, and was part of the back room until the 2016 World T20. Ashwin calls him "an absolute encyclopedia when it comes to technical adjustments and knowledge about bowling". On the phone, Arun unspools his knowledge methodically, step by step, pausing to check if you are keeping track. The source of Ashwin's troubles, he says, was his alignment at the crease, in his delivery stride. "See," he says, "it is about the positioning of your body, by which I mean the alignment, from the back foot to the front foot, from your back-foot impact to your front-foot impact. You're more likely to succeed if the alignment is towards the batter. Then you're perfectly balanced. "If your alignment is either towards leg slip, or it's falling away, it's going towards first slip, if it's not in line, then the body position changes. Also, what happens is, you tend to compensate when you deliver the ball towards the batsman, and you are most likely to deliver only one kind of delivery, because you're compensating. "If your alignments are right, what happens is, there can be a lot of variation. I can bowl where I want: outside the off stump and turn, or I can turn it from the stumps - whatever I want to do, it's a lot easier if I'm pretty well aligned. "If you're imbalanced when you bowl, the effectiveness comes down, consistency, everything it affects. You may bowl a few good balls - again, you're bound to bowl a few good balls - but your consistency will come down, and also, you may tend to get a lot more tired than normal, because you're compensating consistently." 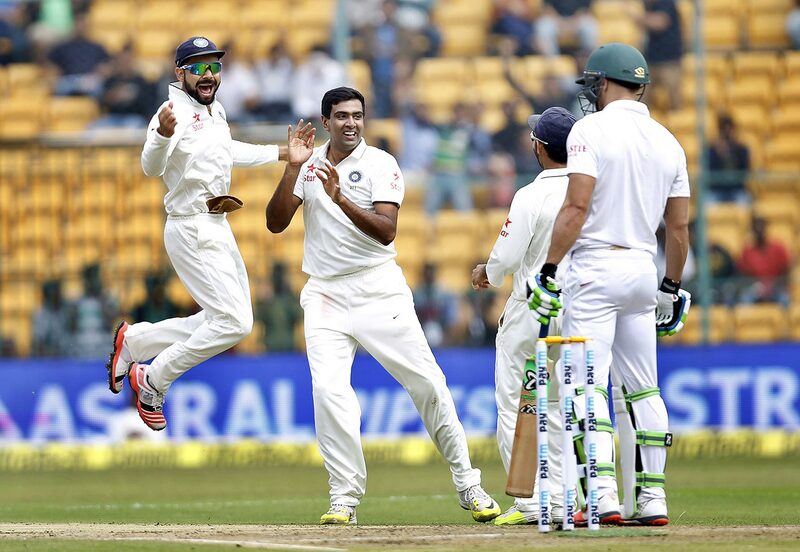 Ashwin's alignment was off-kilter, his front foot going too far across in his delivery stride. It was only a matter of three or four inches, according to Arun, but it was enough to lose balance at the crease. It wasn't a new issue. A number of experts had spotted it during India's home series against England in 2012, when Monty Panesar and Swann comfortably outbowled Pragyan Ojha and, in particular, Ashwin, who routinely dropped short or strayed onto the pads while taking 14 wickets in four Tests at an average of 52.64. After that series Ashwin worked on his alignment with Sunil Subramaniam, his personal coach since his Under-19 days, and bounced back with 29 wickets at 20.10 in India's next series, a 4-0 whitewash of Australia at home. "Many people say a field enhances your chances of getting wickets, but actually it's the other way round. Your ability to get wickets demands those fields"
By the end of the year, when India went to South Africa, Ashwin's form had flagged again. There, and in the tour of New Zealand that followed, he took just two wickets in the space of eight ODIs and one Test. In the fourth innings of the Johannesburg Test, he bowled 36 wicketless overs as India nearly let South Africa chase down 458. Ashwin was dropped for the next Test, in Durban. That was the start of his extended spell out of the Test side. By the time India toured Australia in 2014-15, Ashwin still hadn't found a lasting solution to his alignment issue. 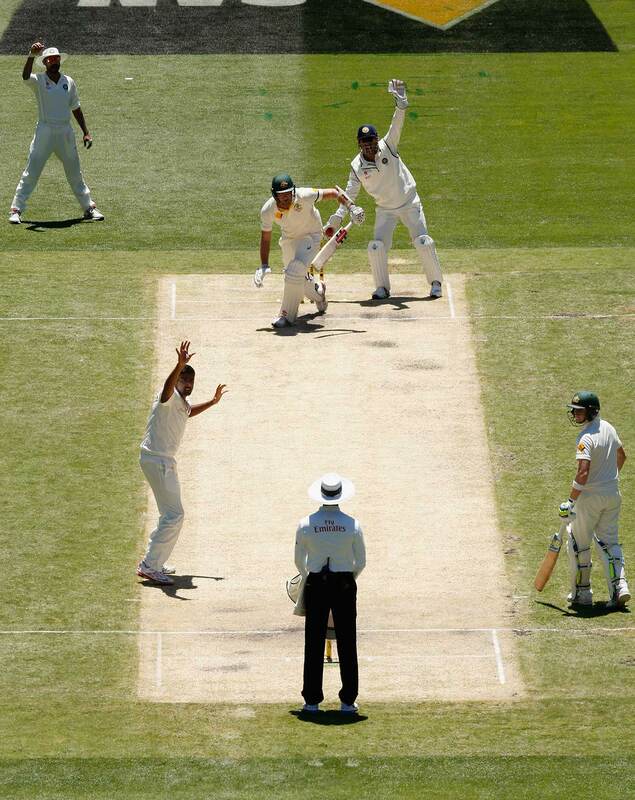 Finally, in Adelaide, Arun identified the cause, which occurred further back in the bowling-action chain: the load-up, the way he sets up with his bowling and non-bowling arms prior to his delivery stride. "See, a bowler has control only over two things - his run-up, and the way he loads," Arun says. "The rest, everything is reaction. Reaction gives you feedback as to what needs to be done, but most people tend to correct the reaction rather than the action. So you need to work backwards and see what exactly you need to address. So subtle things like how you load can determine where your foot lands." With this insight, watching videos of Ashwin's action before and after Adelaide is illuminating. Focus on his right hand, and what it does during his pre-delivery jump. In the 2012 home series against England, it is above his right shoulder when he takes off, off his left foot. By the time he is at the top of his jump, it has wandered outwards - dipping behind his shoulder and then sweeping to the right until his arm forms an L by his side. The sideways movement of his right hand and arm seems to influence a change in his body's momentum. He jumps at an angle to his run-up, to his right, and by the time he's in his delivery stride, the line between his back and front foot doesn't go down the pitch towards the batsman, but across to fine leg. It forces him to pivot around a front leg that leans uncomfortably, and by the time he releases the ball, his right arm has gone beyond the vertical too. From the batsman's viewpoint, it is at 1 o'clock rather than 12. From that position, it seems near impossible for Ashwin to achieve any drift away from the right-hander. When he finishes his action, his follow-through pulls him away towards cover rather than down the pitch. Fast forward to India's one-off Test against Bangladesh in Fatullah in June 2015, two months before the Sri Lanka tour. By now, Ashwin is comfortable with the new action he began to use in Australia, and over the fourth and fifth days of a Test match frequently interrupted by rain, he takes his first Test-match five-wicket haul in over two years. "I think a learning graph should be exactly like a semicircle - start at a good point, go down, and go up again"
At the start of his pre-delivery jump, not much has changed: the right hand is still over his right shoulder. But now, instead of moving to his right, the hand stays close to his shoulder all the way through his jump, pulling backwards like a catapult before moving forward just as he lands on his back foot to begin his delivery stride. Where the movement of his right arm used to disrupt his forward momentum, they are now in sync. His jump continues along the straight line of his run-up, ensuring an efficient transfer of momentum that carries on through his delivery stride, all of it driving towards the batsman. At release, the right arm is at 12 o'clock, as high as it can possibly be. His action just looks so much better. "If you are better balanced, you are in a better position to impart more spin, and also, the transfer of weight that takes place is very effective," Arun says. "It is towards the target, which is again the batsman. It's about being nippy, getting that extra bounce, and also spinning the ball." With this new action, Ashwin is a transformed bowler. The numbers tell the story well enough: before Adelaide, he averaged 28.65 and had a strike rate of 59.10. Since Adelaide, up until the start of the series against England this year, he averaged 21.49 and takes a wicket every 43.7 balls. Since Adelaide he has won four Player-of-the-Series awards on the bounce, in Sri Lanka, against South Africa at home, in the West Indies, and against New Zealand at home. He has become the second fastest bowler, ever, to 200 Test wickets, and his career strike rate - 49.40 - is better than that of any other spinner with a minimum of 150 wickets. Relax the qualification to 100 Test wickets, and only two bowlers sneak in ahead of him. Both - Johnny Briggs and Colin Blythe - bowled before the First World War. Ashwin's rise, of course, has coincided with India playing their home Tests on pitches that frequently turn from day one. It is possible to imagine India's spinning greats from the past being just as effective in such conditions. Harbhajan Singh put out a tweet to that effect. He may have come across sounding a little mean-spirited, but he had a point. India's pitches have certainly become harder to bat on. From 2000 to 2013, visiting teams scored 400 in India at least once each year. 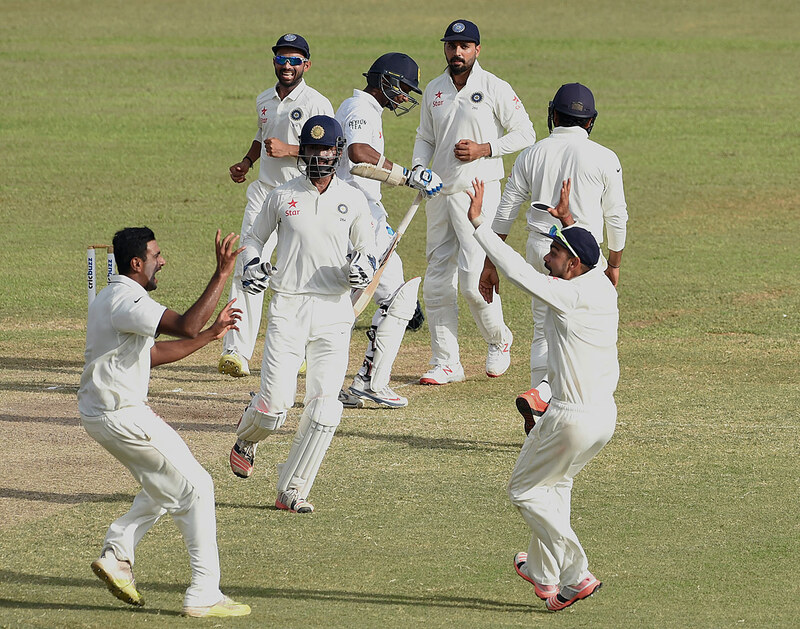 In seven Tests since the start of 2015, no visiting team has managed to get as far as 300*. India's own batsmen average 35.88 at home since the start of 2015, as opposed to 40.95 from 2000 to 2014. It is possible to suggest, therefore, that Ashwin's average after 39 Tests (24.29) might be closer to those of Harbhajan (27.92) or Kumble (28.63) at the same stage of their careers had he played his home Tests in similar conditions. It is hard to argue against the effect of recent home pitches. How else do you explain Ravindra Jadeja, relentlessly accurate but possessing a fairly limited skill set, averaging 17.53 at home and 41.80 away? Ashwin averages 33.23 away, but his record in less helpful conditions, outside Asia and the West Indies, is 24 wickets from nine Tests at 56.58. Nine Tests, however, is too small a sample, and the bulk of them came before his bowling had achieved its current level of completeness. For now, he appears to have all the tools a spinner needs to trouble batsmen anywhere. In his present avatar, he poses as much of a threat with what he does in the air as with what he does off the pitch. Time and again his flight draws batsmen forward, almost against their will, before the ball dips and lands six inches shorter than they expect. Then there's the drift. The era of the mystery spinner, when it seemed de rigueur for spinners to turn the ball both ways off the pitch, dulled the cricket watcher's appreciation of the idea that a bowler turning the ball in only one direction could beat both edges of the bat. Ashwin routinely threatens both edges with his offbreak, because he gets the ball to curl in the air before it lands, scrambling batsmen's judgement of line. In the Kolkata Test against New Zealand in October, he did this to Ross Taylor in the 18th over of a 28-over spell broken only once for a change of ends. The ball drifted away late, causing Taylor to play inside the line, before turning in just enough to miss his outside edge and hit his front pad. From time to time Ashwin still slips in his other variations: the carrom ball, which usually makes its appearance against lower-order batsmen, an orthodox legbreak, when trying to break a long partnership, and a seam-up arm ball that swings prodigiously, particularly with the new ball. With these weapons at his disposal, Ashwin has got on top of some of the best in the world, dismissing Sangakkara four times in four innings, doing the same thing to Kane Williamson a year later, in between leaving Hashim Amla stranded down the pitch in Mohali and deceiving AB de Villiers with a carrom ball in Nagpur. The experience of watching Ashwin bowl is enhanced at the stadium: here you may not get to see pitch maps and close-ups of his release positions, but you can always see where the fielders are. It is the best way to tell how well someone is bowling. November 14, 2015, the first day of India's second Test against South Africa in Bangalore, was the only day of a rain-ravaged match with any cricket in it. South Africa had just lost their first wicket - the left-hander Stiaan van Zyl lbw off Ashwin - and the fielders rearranged themselves as the right-hander Faf du Plessis took strike. The leg side was packed: short leg and leg slip hunched around the bat, a catching short midwicket, a square single-saving midwicket, deep backward square-leg, long-on. On the off side were only three fielders: slip, backward point, mid-off. On the first day of a Test match, on a flat surface where India picked three seamers and chose to bowl first, Ashwin, bowling the eighth over of the innings, was leaving the cover region entirely vacant, and telling a batsman of some repute to go ahead and drive him against the turn. It isn't a revolutionary idea; skilful bowlers often leave gaps in the field. Yasir Shah, for instance, often bowls without a midwicket, daring right-hand batsmen to play him against the turn. Ashwin says he has bowled without anyone at cover - or, occasionally, at backward point - since the start of the Sri Lanka tour in 2015. It is a reflection of three things: his confidence, his control over length, and his ability to beat batsmen in the air. The vacant cover region is both an invitation and an illusion. The batsman sees a big gap but barely gets an opportunity to exploit it. By leaving that side empty, Ashwin bottles up the leg side, where the ball goes when batsmen play with the turn. Like football teams that reduce the size of their opponents' pitch by maintaining a high offside line and pressing from the front, Ashwin shrinks the batsman's scoring areas with his 6-3 leg-side field. It is made possible by his length and deceptive trajectory. "Many people say a field enhances your chances of getting wickets, but actually it's the other way round," he says. "Your ability to get wickets demands those fields. You have to understand where your good balls go for runs. You have to understand each and every ball, that if you're trying something to get a wicket, that it will go in a certain place, and you have to protect that field. So understanding of your own bowling, understanding of the game scenario, understanding of the batsman, just controls the entire aspect of the game." That morning in Bangalore, du Plessis had only faced two balls when he jumped out of his crease. He may have been looking to get to the pitch of the ball and drive through cover, or perhaps to pick up a single down to long-on. It was impossible to know, because he did not get anywhere near the pitch and played a shot of pure desperation, reaching out as the ball turned into him, trying to flick it somewhere, anywhere, into the massed leg side, praying it didn't go in the air. It did, and Cheteshwar Pujara took a low, tumbling catch at short leg. The new action, Ashwin says, is similar to the one he started his career with, and that some of the faults that crept in were the inadvertent result of changes he made while trying new things. This included one match in the Asia Cup in 2014 when he came out in full sleeves and bowled with an action not dissimilar to Sunil Narine's, down to a slight kink in the elbow. "Why should I lag behind if someone else is getting a competitive edge?" he asked at the time, but shelved the experiment after that one match. He has no regrets about all the experimentation, even if its indirect effects on his bowling caused him a spell out of the side. "Over a period of time, there were a lot of changes," he says. "My loading changed, my wrist position changed, the way I was bowling changed. I had a hyperextension, so all these things were happening, but to get an in-depth knowledge of what exactly I was doing myself took a bit of time. "And I think it's only natural that you give someone time to understand themselves, because all these things had to be done for what I am today. I think a learning graph should be exactly like a semicircle - start at a good point, go down, and go up again - I think you need to go that whole semicircle." Going through that semicircle took a lot out of Ashwin. Prithi Narayanan, his wife, says he was "pretty down" during the months he spent out of the Test side, but that he emerged from that period a calmer and more reflective person. "He was a bit upset, but that's the thing," she says. "If he gets upset about something, that means he's just going to come back stronger. He went on working on his game like, you know, like a maniac. The first thing he questioned was himself, like, what am I doing wrong, what is it that I need to work on… I think the mental conditioning, eventually, during those eight-nine months helped him come back stronger. "I still live around the same area, I live in the same place for a particular reason. I know all my neighbours. I play inside my house, I invite my friends over"
"Not only the fact that he didn't play, but when you sit out, you really see a lot more than you would on a normal game-day, so that mental wave I think he really needed to ride, and it's a lot easier for him to deal with things that are happening now. To be honest, I think it's showed a lot on his personal life also, in the sense, he grew a lot more patient. So he became… there's this new, calm Ashwin that I'm seeing. Looking back, I think it just made him a much, much stronger person than he was." A brief, unexpected, and soon-to-be-explained detour into my own childhood, and the academic year 1994-95. A third-standard classroom at the Padma Seshadri Bala Bhavan (PSBB) Senior Secondary School, a substitute teacher using an age-old tactic to keep students engaged: she invites everyone, in roll-number order, to come up to the front and show off any talent they may possess. When my turn comes, I sing "Tu cheez badi hai mast mast", the Bollywood hit that has topped the Superhit Muqabla countdown for many weeks leading up to this moment. I also dance. In the same classroom is R Ashwin. He isn't among my close friends, and the threads that connect us will only weaken in the years to come. The following year he moves to a different classroom, having chosen Sanskrit rather than Hindi as his second language. After Class 10, he moves to St Bede's Anglo Indian Higher Secondary School. By the time the journalist meets the first-class cricketer, we haven't met for at least six years. On July 14, 2008, I am at the Pachaiyappa College cricket ground, where Ashwin is playing for Vijay CC against Globe Trotters. I am chatting with a physio, who is unhappy that the lunch menu includes puliodharai (tamarind rice), and is spelling out its deleterious effects on player hydration. The lunch break ends and the Vijay CC players re-enter the field. One of them calls out my name. It is Ashwin. He grins and breaks into "Tu cheez badi hai mast mast", jiggling his hips. By this time, I have had the chance to interview Ashwin, a little before this game, and to get to know the serious, analytical side of him. Here, out of the blue, is a glimpse of the boy I had known, not all that well, in school. Another memory. A school bus, a field trip. We are on our way to the Guindy National Park, perhaps, or the Birla Planetarium and the Periyar Science and Technology Centre. We are claiming ownership of the road and everything on it, by means of a nonsensical chant that has been passed down through generations of Chennai schoolkids. You can still hear versions of it at the MA Chidambaram Stadium. And so on. Ashwin leads the chant, in more or less the same stentorian voice you hear today. You could imagine him playing serious cricket one day, but perhaps not becoming international cricket's most obsessive nerd. Prithi was also struck by this change. Years before she married Ashwin, she was his classmate, from classes eight to ten. She lost touch with him when he moved schools, and bumped into him again when she worked for an event-management company that handled Chennai Super Kings. "[He was] quite different, actually, because I couldn't stand him in class eight," she says, chuckling. "I couldn't stand him at all. He was extremely naughty, and his group - not his group, but just this bunch of guys in class - ended up getting pulled up for something or the other. They were the same bunch that went out and played cricket, they played ball-badminton, they played tennis or football or whatever, and they were also the same group that got in trouble… I was trying to be studious and all in school, but this guy was this brat who would be up to something or the other. "He still has a bit of a playful side to him, but behind all that is a great level of maturity. What I liked [when I met him again] was how grounded he really was - very, very easy and straightforward guy to talk to. Very clear about what he believed in and what he stood for and how his career was coming and how things were going to go in the next couple of years. A lot of differences, in fact, but what hadn't changed was the playfulness and the passion for the game. "But otherwise, yeah, he's just grown up to be way nicer than what he was in Class 8." Perhaps the serious, driven side was always there, visible to those in close cricketing contact with Ashwin. Perhaps as cricket began to define him, so did this side of his personality. 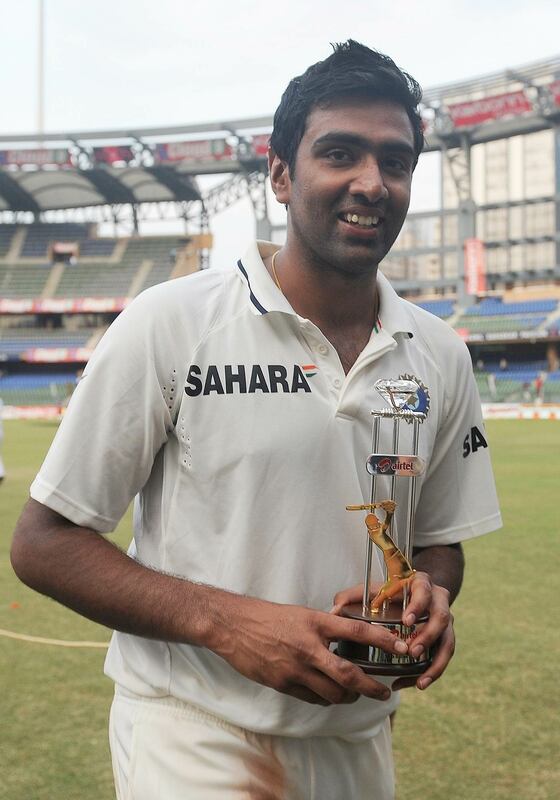 You need to develop that fierce drive to get as far as Ashwin has in India's highly competitive cricket universe. An early turning point in Ashwin's career came during a City v Districts Under-14 match in Tirunelveli, when he suffered a pelvic ligament tear while batting. "I just went on the front foot and blocked the ball," he says, "and just collapsed." The injury triggered two decisions. The first was to move to a school that would allow him a better chance to further his cricket career. "PSBB was very, very helpful in actually giving me two months off," he says. "I was in bed rest, never turned up for school, and then wrote my annual exam, and went on to tenth. I had to take a break [from the game], full year, because I was not allowed to play cricket, but then I wanted to take one good shot. I thought if I moved on to St Bede's the opportunities were better. I could practise on a daily basis, which was not possible at PSBB, so I took a final shot and went to St Bede's in 11th." The other decision was to bowl offspin. At the time, Ashwin was an opening batsman who bowled medium pace, and while his batting remained his primary focus through his junior years - he even played for India Under-17 as a batsman - he gave up medium pace. "I stopped bowling medium pace because of my hip injury, had not given offspin any try," he says. "I just played a couple of games for PSBB where I bowled offspin, but my coach was very disappointed. He said, you should be bowling medium pace, India doesn't have any medium-pace-bowling allrounders, medium-pacers are very important, and all that, very disappointed. "So when I moved on to St Bede's, they needed someone to bowl, because generally towards the end of a net [session] everybody becomes tired. So they call upon the batsmen to bowl to the bowlers, and I started. The coach there, Vijayakumar, he asked me, 'Why aren't you bowling otherwise?' I said, 'I don't know, they didn't give me any chance to bowl.'" Ashwin began bowling regularly in matches thereafter, but not in state-selection trials. It was an odd situation, reflecting the quandary before CK Vijayakumar, the coach at St Bede's: he rated Ashwin's bowling highly but knew he would make Tamil Nadu's junior teams on the strength of his batting alone, and therefore asked him not to bowl in trials and jeopardise the chances of the school's other offspinners. "He categorically told me that I shouldn't bowl offspin in the selection trials," Ashwin says. "But when I played Under-17 and I was about to leave the school, he told me very clearly, 'One day you'll play for India as an offspinner.'" Ashwin had become a seriously good offspinner by the time he attended the Tamil Nadu Cricket Association (TNCA) Under-19 spin camp where he first met Sunil Subramaniam, the former Tamil Nadu spinner who would go on to become his personal coach through the first few years of his senior career. Sunil, a tall, aggressive left-arm spinner who took 285 first-class wickets at 23.53 and considers it a "miscarriage of justice" that he never got to play for India, recognised something of himself in Ashwin. "Very similar, even the actions are pretty similar," Sunil says. "Just that I bowled left-hand and he bowled right-hand. He could generate the same bounce I was generating, and when I first saw him he was not somebody who was bowling one type of… [usually] you ask somebody to bowl, and they just bowl, a certain type of bowling. You could see a thinker, he kept trying something - not that he was not consistent with his length, but the trajectory was different, the angles were different, he was trying different things." He also saw something of the personality cricket fans would get to know in the years to come. "You know what I used to do?" Sunil would give his players a questionnaire, to try and get into their minds, and see what made them tick. "Generally to dwell on why is he bowling in the first place, why spin bowling - there are so many other things to pursue, why spin bowling? Then where did he learn his cricket from, what do you want to be - strengths, weaknesses - you'll get an insight. You ask logical questions you'll get to know. At that age people write, you know, normal answers they'll give, and very few reveal a part of themselves. Some do, but very few. "I still have the first questionnaire that I gave [Ashwin] when he was about 17 or 18. I could dwell into his mind, what is there in his mind. The answers he gave me were super blunt. Frank, straightforward, no PR business, no trying-to-please-the-coach answers. Those things, they gave me a kind of insight about what kind of a person he would be. The person behind the bowler. "Right from ten years old, I was always a rebel, and I used to take a lot of flak for it, and they used to drop me from being a captain, not make me captain sometimes, all that happened"
"Typically, at 400 for 3, you would want to have such persons around you. He wants the ball, he wants to have his field, and at the same time he would be flexible as to how to go about it. He won't shirk. I've seen a lot of bowlers, if the conditions were good they'll all be queueing up. But if the conditions looked a little challenging, they won't be very enthusiastic. I've seen it at state and almost Indian level. "[Ashwin] struck me as somebody who would be up for it." 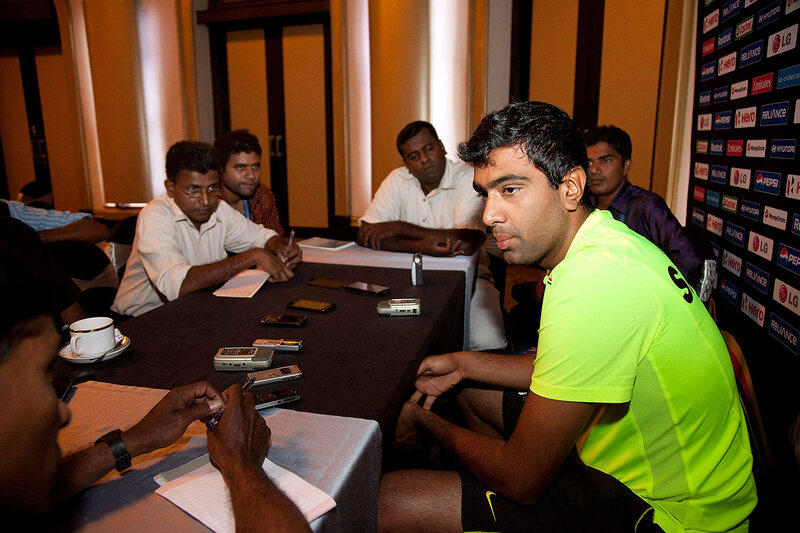 At school level, Ashwin says his relationship with his coaches was not always smooth. "Because I liked a certain sense of individuality, I did things my own way. When you're playing Under-10 and Under-12 cricket, school coaches never really appreciated the fact that you can have slips. But I couldn't fathom the fact that you can't have slips when you start with the new ball. I always used to have two slips. At ten years old, people used to drop catches at slip, make no mistake about it, but I would always start off with slips. "I didn't like the idea of having a third man, because a third man was always a wasted fielder as far as I saw, and to actually hit the ball to third man you needed a basic sort of control with your batting, and otherwise you nicked it to third man, so you might as well have slip in position to get a wicket. "Right from ten years old, I was always a rebel, and I used to take a lot of flak for it, and they used to drop me from being a captain, not make me captain sometimes, all that happened, but since 12 years, once I matured and I was able to communicate better, I was always a captain for my school team, college team, or wherever I went." Unlike his school coaches, Sunil welcomed Ashwin's questioning attitude. "I didn't want to be coaching somebody seriously who would listen to everything the coach says and take it as gospel," he says. "You can skin a cat various ways. All it requires is a guy's persistence to doing it his way. At times, I would never agree with what he says, and he would never agree [with what I said]. But it was interesting. Something came out of such conversations." Sunil also encouraged Ashwin's tendency to try new things - bowl with the new ball, use variations. "My dad," says Sunil, "he was in the air force, he used to say - you're not going to die. The bullet is not killing you. If you're in a war, you try the wrong thing, you're dead. But if you're going to play, what will happen? At worst it won't come off. But if it comes off, you'll be brilliant. "That's one thing people who try different things have to live with. You will cop a lot of criticism. When the going gets good in India - you know, our whole society is based on all this - everybody will pile on. That is something we must accept if you're trying different things." 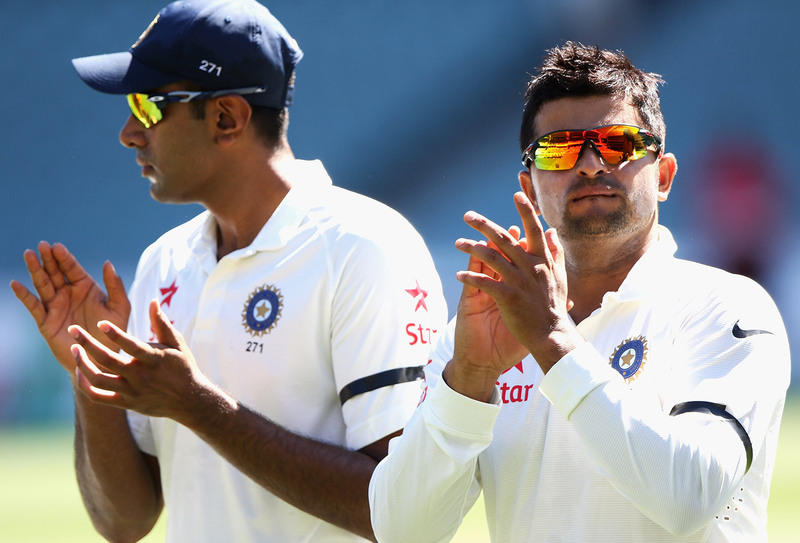 Ashwin has faced all kinds of criticism over the course of his career, fair and unfair. Quite early in his career, possibly during the 2011-12 tour of Australia, when he became India's unofficial spokesperson as they lost 4-0, he began to develop a homespun defence mechanism in his media interactions. A sense of suspicion about the interviewer's motives, conscious or subconscious, jostled with his natural tendency to speak his mind and explain things in often circuitous detail. It gave you the sense that he wasn't just answering the question you had asked but also other questions he assumed you were implying. It took him into unpredictable tangents, which made him both highly interesting and a little frustrating to talk to. Prithi says he has become less defensive and better at communicating his thoughts as his career has gone on. "Earlier, I think he was a little too upfront in what he was saying, or… he was talking a lot faster than he was thinking, but now he's probably able to communicate his thoughts and channelise them a lot better," she says. "I'm sure you, being media guys, would have seen. I mean, initially, he was always considered a bit arrogant…"
She laughs. "See, you must give it to him. In 2011, when we toured Australia, he was handling a lot of press conferences, and he was still, I think, a newbie at that time. So as a much younger guy, he started, maybe, being a bit defensive, or, I don't know, maybe he had to be defensive at that point in time. "I need to be clear that his thought process has been the same, the only thing [that has changed] is the way he communicates and makes you probably understand what he's trying to say." There is definitely a greater ease about Ashwin's media interactions now. His responses are more considered, more direct, and when he speaks his mind he does so in a more confident manner than before: whether he's talking about the effect of T20 on spin bowlers or his ambitions as a batsman. If that differentiates him from other India cricketers, his Twitter feed sets him further apart, offering a genuine window into his personality. It tells you how much of a cricket nerd he is - "Englands field placing has been spot on.The short extra for Rogers and mid on really straight for Watson. #Ashes" - and how that nerdery extends into other sports as well - "Gasquet v Dimitrov likely to be the match of the day??" It tells you about his love for Chennai - "Midnight drive through the beach road, haven't done this for a long time. Will get to do this a lot more this summer" - and for the Tamil film composer Ilaiyaraaja - "Rain and Raja sir music, surely better than most combos that I know." On YouTube, he does inch-perfect impressions of Tamil cinema's two biggest stars, Rajinikanth and Kamal Haasan. He also interacts directly with fans, whether to reminisce about bus rides across Chennai, or, quite often, to hit back sarcastically at uninformed criticism. He comes across as someone eager to bring down some of the walls that come between cricketers and fans in India. Social media allows him to do this with a degree of control over the exchanges. It simply wouldn't be possible in his day-to-day life. "He loves to talk, and he likes to dig your brain," says Prithi, who's just as active on Twitter. "So if it's something - a good subject, a good topic, a heated debate, something that he really is passionate about… He doesn't really get too much into politics, but say science, or technology, or a general, like a human thing somewhere, he would definitely get into it. He would have a chat if he had the time, and if he knows that they're just not trapping him to get something out of him." Ashwin has reconciled himself to not being able to live an entirely normal life while at home, but still treats himself to the occasional taste of his pre-celebrity life. 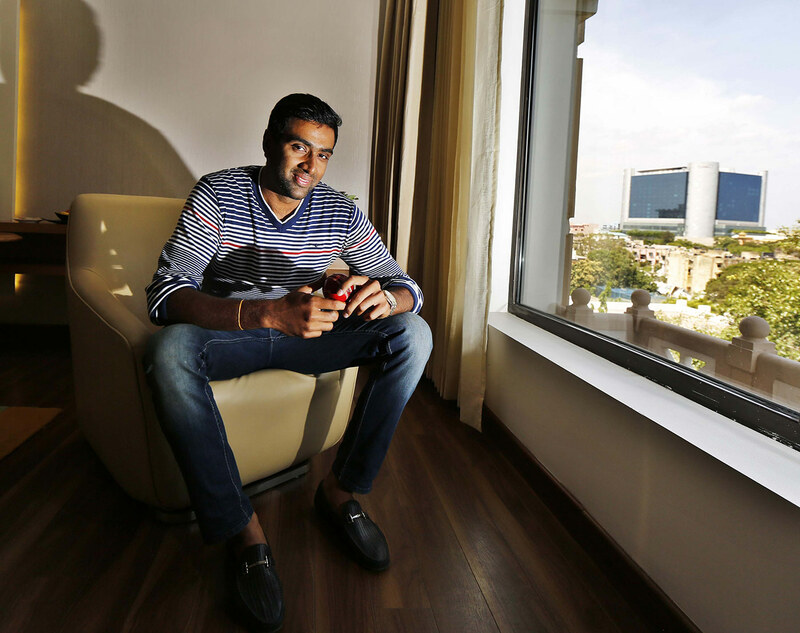 "I can't go to all the places with a lot of freedom," Ashwin says. "I believe that however big a celebrity you are, you can still do what you want. If you want to go to the corner shop and have a glass of tea you can still afford to do it, but there are a lot of repercussions you invite. You invite a lot of people, you tend to hear a lot of things that you don't want to hear, sometimes. Sometimes you encourage a lot of people coming to you asking for your autograph, photographs. After 10 or 15 it becomes one too many, but I still end up doing a lot of things I like. "If you want to go to the corner shop and have a glass of tea you can still afford to do it, but there are a lot of repercussions you invite. You invite a lot of people, you tend to hear a lot of things that you don't want to hear, sometimes"
"For me it is very important to go to a place you want to go to. It gives me immense joy and pleasure. I still live around the same area, I live in the same place for a particular reason. I know all my neighbours. On the weekends I still like playing on the roads, but I can't play on the roads anymore, so I play inside my house, I invite my friends over." Back in 2010, when Ashwin had just returned to Chennai after playing the IPL final in Mumbai, he showed up at the Guru Nanak College cricket ground to watch his Vijay CC team-mates play a TNCA league match. He cycled to the ground, wearing a skullcap and sunglasses to conceal his face, which was by then well-known thanks to the IPL. "I've done it quite a few times," he says. "On another day I might not have worn a skullcap and glasses and I might have gone, but I just didn't want to attract too much attention. Because even on that day actually people recognised me and came behind on a bike and all that, and I didn't want to do that. "I used to ride my Scooty around the area, I still love doing it, but my father doesn't allow me, and on top of that my wife really takes a stand about it." Three days after the third India-New Zealand Test in Indore, I'm riding around Ashwin's neighbourhood on a scooter. Most high-profile Tamil Nadu cricketers tend to move to posh localities in Chennai's south-eastern corner: Adyar, Thiruvanmiyur, MRC Nagar, or beachfront properties along the East Coast Road. Ashwin simply rebuilt the house he grew up in, in West Mambalam. Chennai's suburban railway line forms the eastern border of West Mambalam, separating it from T Nagar, the city's busiest shopping district, leaving its residents within touching distance of, but clearly demarcated from, the pulsing heart of commerce and enterprise and blatant zoning-law violations. Fifteen years ago West Mambalam was the definition of staid: somnolent streets, grocery stores advertising "High Class Provisions", and a far-above-average concentration of temples and shops selling boli. The perfect sort of place, in short, to grow up playing street cricket in, with barely any distractions. The temples and bolishops remain, but my ride around the neighbourhood reveals that it is now bursting with other food options. Not fancy food; every second shop on its main thoroughfares is a tiny, stand-up eatery selling chaat or parotta or plantain chips or juice or soup. It's soup that I am specifically looking for, a soup stall that Ashwin used to visit every evening after playing tennis-ball cricket, until as recently as 2012 or 2013, when he was already an India regular. "We would finish playing by around 6.30 in the evening and go there," says Sai Kumar, one of Ashwin's closest friends, who now lives and works in the UK. "People would recognise him, but he wouldn't care; he'd come there wearing the same T-shirt and shorts." The stall is a pushcart with a tubelight and a string of marigolds hanging from its roof, and tacked to its outer cladding is a list of daily specials, one of which is "mind and coriantar soup". It is located at a busy intersection, and at this moment, roughly a quarter to eight in the evening, a throng of slurping patrons stare placidly at a minor jam of honking scooters. It is easy to see why Ashwin can't come here any longer. 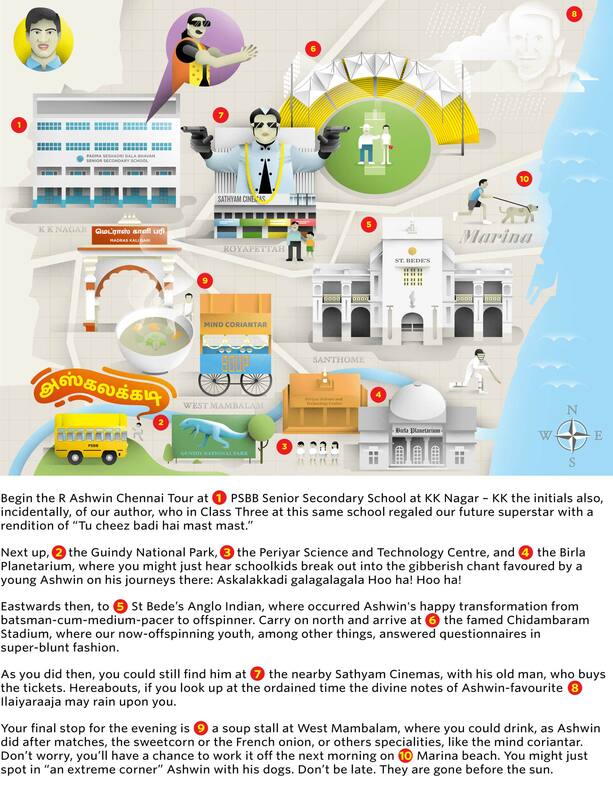 That he did until not so long ago says something about Ashwin; it probably says something about Chennai as well. I learn from the man running the stall that Ashwin likes his sweetcorn soup and French onion soup. I order the mushroom. 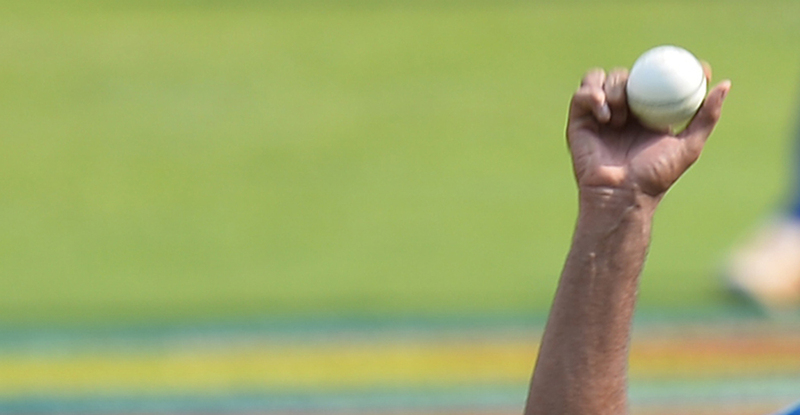 It is scalding, and I ask for a second paper cup to insulate my fingers, a move Ashwin would no doubt scoff at given that he got his 200th Test wicket with a corn on his middle finger. The soup comes with a topping of cornflakes and coriander, which add textural contrast and a herby freshness to the savoury depth of the mushroom. It is an excellent way to finish a session of street cricket: flavourful, nourishing, and light on the pocket. The soup stall is now off limits, but Ashwin finds the tug of some old haunts harder to resist. "I go to Sathyam Cinemas, my father buys a ticket. Me and my father have watched every single movie that could be ever watched. We book our tickets and go and get our own private parking, because the theatre acknowledges that. They come and accompany me but I don't make any hue and cry or fuss about getting people to actually protect me. I just cannot avoid going to Sathyam Cinemas. "Then on a fine day I go in the mornings with my dogs to the beach, 5.30 in the morning. But I go to the extreme corner, and before the sunlight comes out I come out." He reveals something about the kind of Chennai person he is when I ask which beach he means: Marina beach, full of character with its lighthouse, wide expanse of sand and long promenade punctuated by statues, but often derided by the city's yuppies for being too dirty? Or the smaller, more upmarket Elliott's beach in Besant Nagar, with the Karl Schmidt memorial (named after, according to Wikipedia, "a European man who drowned in 1930 trying to save the life of a girl") looming incongruously out of the sand, and a cluster of cafés and restaurants across the road? "Marina," Ashwin says, before I complete the question. "I love Marina. I don't quite like going to Besant Nagar. Marina. I take my dogs there, I have my own run."